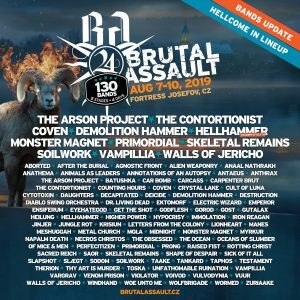 A slew of seminal and notable acts have been added to the 2019 edition of Brutal Assault. The addition of Soilwork, The Arson Project, The Contortionist, Vampillia, Walls Of Jericho, Primordial, Skeletal Remains, Demolition Hammer, Monster Magnet, Coven, and Hellhammer – Triumph Of Death have surely made the event worth attending. The 24th edition of this annual fest will be taking place at Jaromeř – Old Army Fortress Josefov in Czech Republic from August 07 to August 10. Alongside many additional attractions, 130 bands from all round the world will set the stage on fire. For further updates, visit Brutal Assault’s official site and event page.